When Date Night was in Florence in 2010, we were very impressed by the Florentine food and the style in which it was cooked. Recently, while perusing Scoutmob, the budget committee came across a Scoutmob deal at Taverna Fiorentina, which according to their web site, promises “time-honored, authentic Florentine dishes”. The deal is only good Sunday-Thursday, and on a rainy Thursday night, we decide to check it out. The Taverna is in a shopping center that’s been there forever, beside the Kroger on Cobb Parkway, just before you cross over the river into Atlanta. They are going for that neighborhood Italian vibe and the interior achieves it. 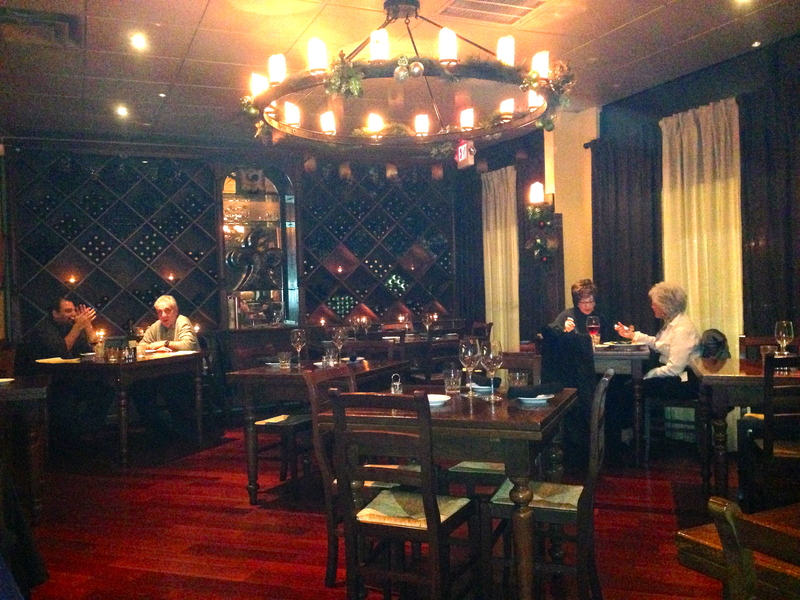 The dining room is small and only holds about 60 people. It probably gets crowded in here on the weekends. There is a small seating area outdoors, which someone with a good sense of humor has set. It’s funny because it’s 45 degrees, and we don’t think anyone is going to sit outside. Beer people that we are, we like Chianti Classico with our Italian fare. 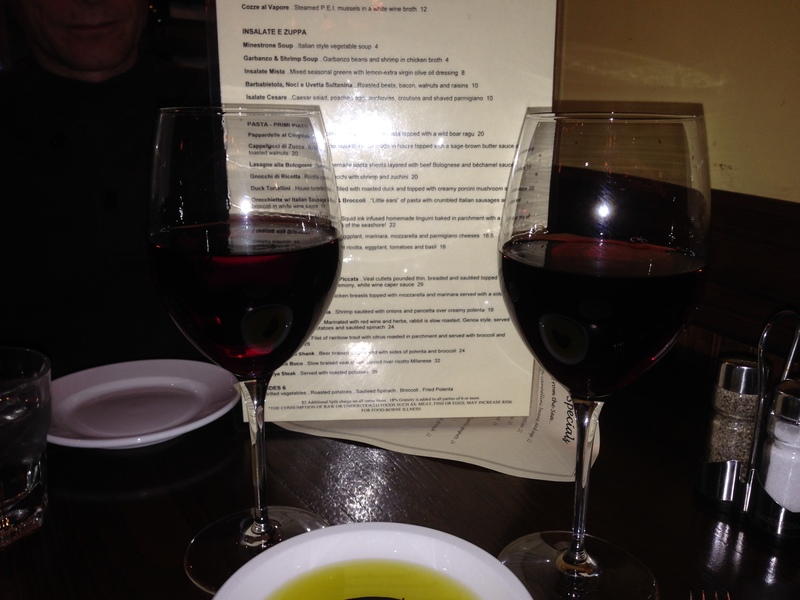 We get two glasses of Cetamura Chianti, which is a low-end red from Tuscany. It’s not a Brunello, but it does the trick. 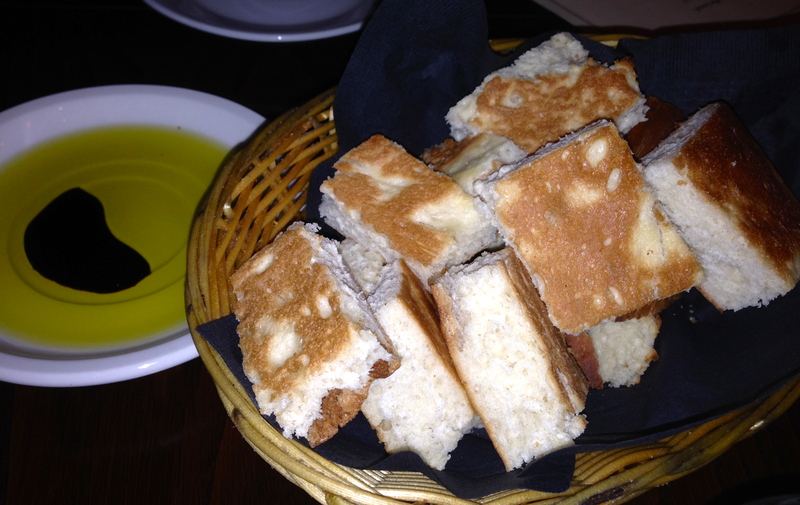 They bring us warm bread with oil and balsamic before the meal. It’s not your basic Italian bread, but more like a ciabatta. We want to eat the entire basket, but we are able to restrain ourselves and leave room for the meal to come. 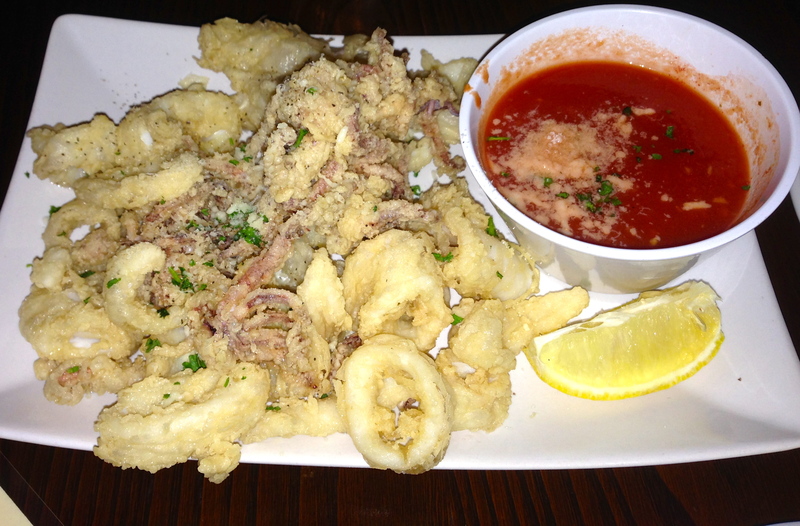 We start with the fried calamari, a staple on many restaurant menus these days, Italian or not. It looks underdone in the picture because it was not cooked long enough. We wish they had left it in the deep frier for 30 more seconds. There are nine pasta dishes on the menu and eight entrees. We both order from the pasta section, and Date Night is about to take a strange turn. I order the Black Ink Linguini al Cartoccio. It’s wrapped in parchment paper. Unwrapping this “gift on a plate”, I find shrimp, mussels, and calamari on a bed of steaming black noodles, which get their color from squid ink. This is the best dish of the night, and it stays hot throughout the entire meal. The noodles, al dente at first, keep softening up in the steaming hot seafood broth. Now the fun begins. Eve orders the Eggplant Parmigiana, and here’s what it looks like. From the photo, it looks like the menu description, “layers of eggplant, marinara, mozzarella and parmigiano cheeses” on top of spaghetti. As she digs in, Eve mentions that this is a very strange way to serve eggplant parmigiana and that it tastes more like pasta with an eggplant sauce. We switch plates halfway through the meal and I agree with her, that this is the weirdest eggplant parmigiana ever. It’s good, but not what we thought we ordered. I think to myself that this is how they must make it in Florence, since these dishes are supposed to be authentic. When we get home, I call up the menu online and the mystery is solved. 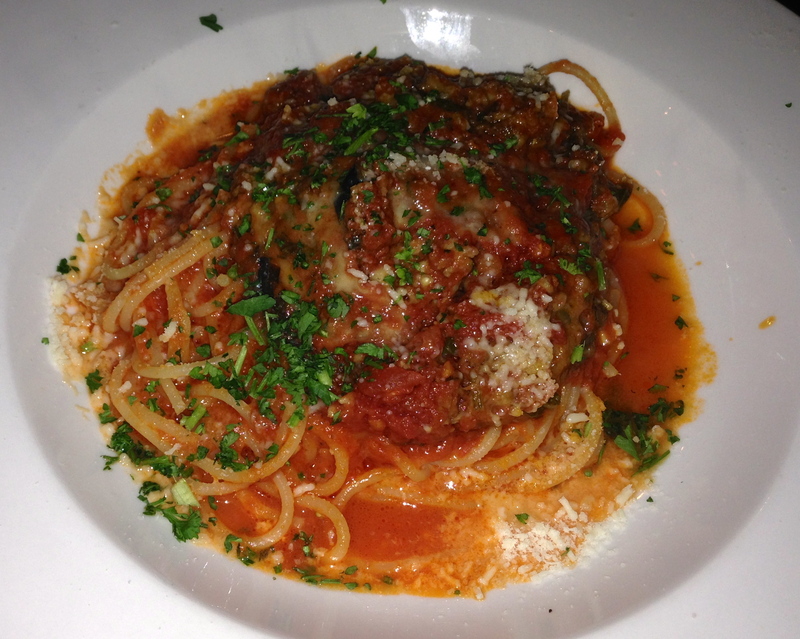 We were served the Spaghetti Norma, which is “marinara, salted ricotta, eggplant, tomatoes and basil”. At least we got something that had eggplant in it. Perhaps we should have asked in the restaurant before we ate the whole thing, and we do not remember anyone asking how the food was. Shame on the restaurant for serving us the wrong menu item. Back in the Taverna, we order dessert. 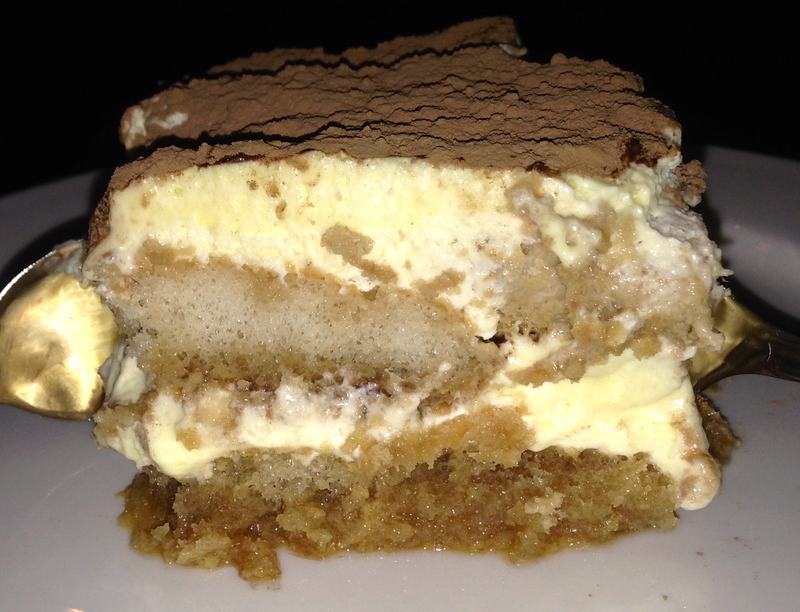 Tiramisu is always a good way to end a heavy meal. It’s light and has a nice coffee flavor. The cake is soaked in rum, which gives us a nice finish. 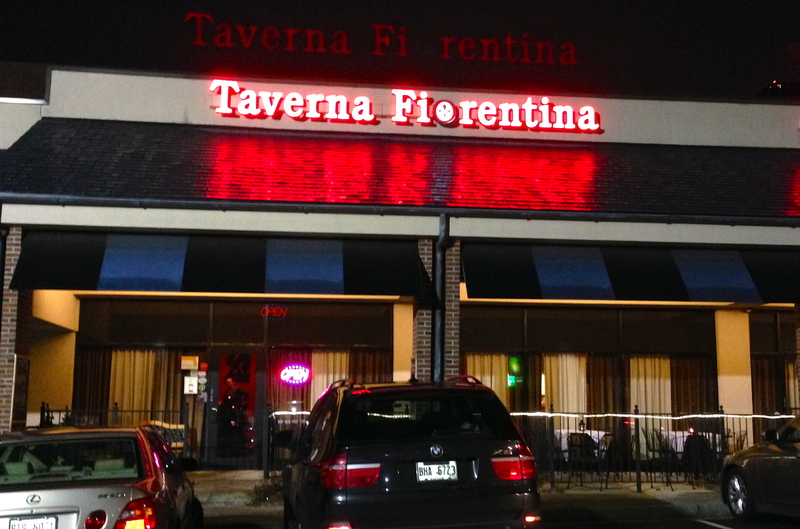 The Bottom Line on Taverna Fiorentina: A mixed (“mista” in Italian) bag. 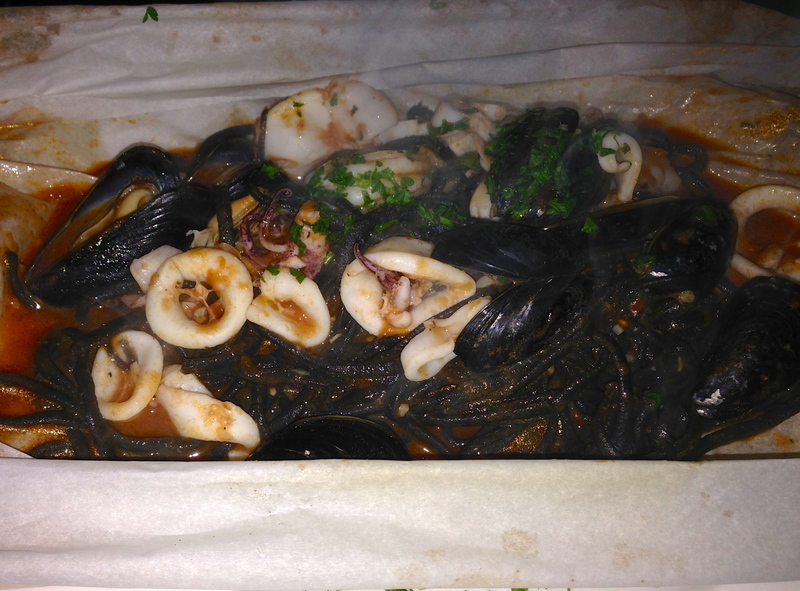 The black ink linguini was wonderful, and we highly recommend it. Anita, our server, was a charming and authentic Italian from Florence. However, the calamari was undercooked, and it’s hard to forgive serving us the wrong dish. The meal was expensive (the Scoutmob helped), and at these prices, we expected better than nearby Scalini’s (Date Night #80, 8/9/13), which is half the price and just as good. For this Date Night, Taverna just didn’t deliver.